While we see Jesus heal many people instantly, healing can also be progressive - 'from that hour' or 'as they went.' This lady suffered breast cancer 6 years ago and the treatment damaged and removed lymph nodes and tissues under the arm, leaving pain and severe restriction in her right arm so that she could not raise it above shoulder height. After the first few prayers, all pain left, but the restriction remained. John encouraged her that the anointing would keep working on her while she sat in the meeting and we'd see how she was later. 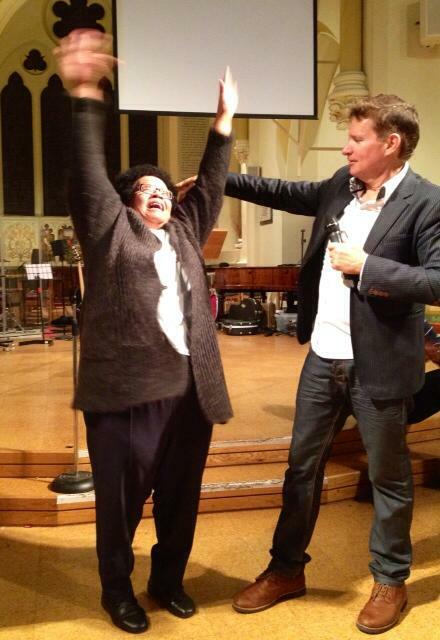 Half an hour later she called out excitedly and waved her arms above her head, totally healed and overjoyed. We see this happen to many people in the meeting who receive the beginning of their healing at the start of the meeting and by the time they leave they are completely healed or they wake up the next morning healed. Never be discouraged if you aren't healed instantly or totally to begin with - God is at work and it's important not to abort what He is doing through unbelief or disappointment if your miracle doesn't come instantly. Posted in Cancer & Other Diseases, Creative Miracles, Other Physical Healing and tagged with john mellor, cancer, restriction, damage, tissue, lymph nodes, breast, miracle, creative, pain, severe, arms. September 17, 2013 by Brae Wyckoff.